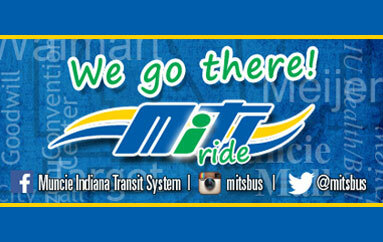 Public Art Archives - Muncie Visitors Bureau | Visit Muncie! Created by artist Tuck Langland commissioned by John Surovek to honor Alice Nichols, a former chair of the university’s art department. “She was as much a friend to me as she was a mentor. 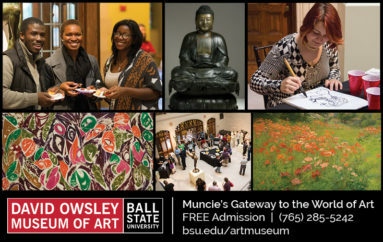 I can’t imagine how many other people she helped in the way she helped me.” Ball State University alumnus John Surovek. The statue, owned by the City of Muncie, is a memorial to Edmund B. Ball. After his death in 1925, his family searched for a suitable memorial to him. 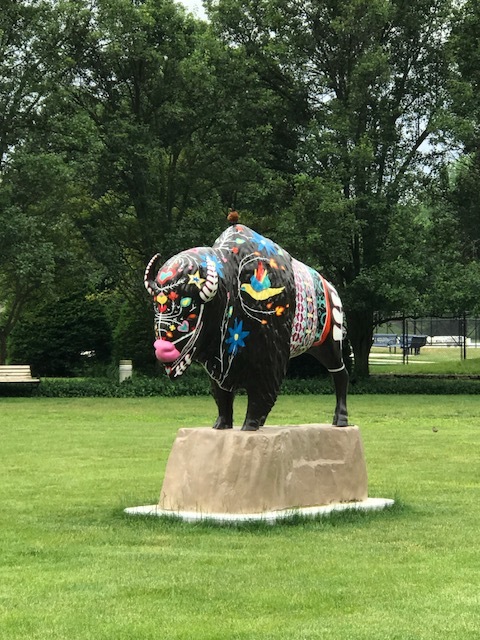 They settled on a replica of the “Appeal to the Great Spirit” cast in bronze, and erected on a site just east of the Ball family homes on the north side of the White River in Muncie. The original sculpture was created by Cyrus Dallin in 1909 and is a Plains Indian. The statue and surrounding park were dedicated in 1929. The statue does not depict Chief Munsee. There is no indication that there ever was a chief named Munsee. In addition, the statue depicts a Plains Indian. 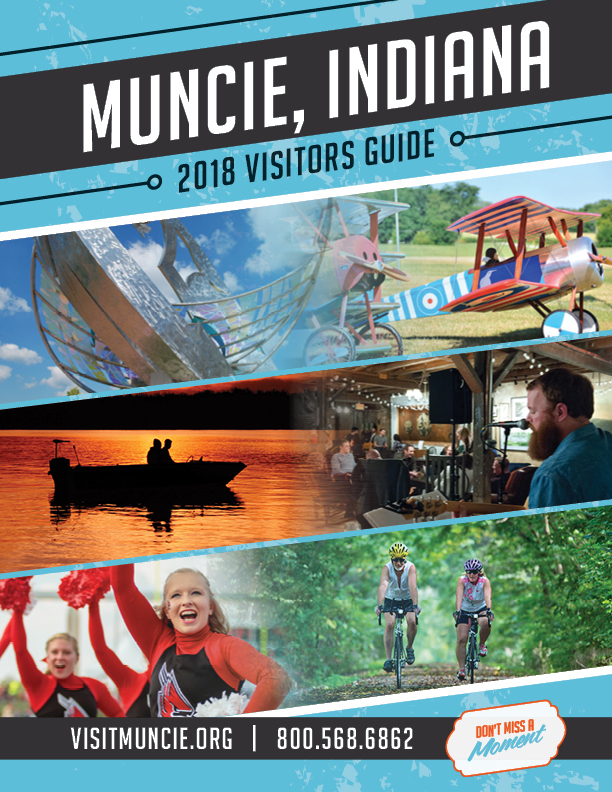 The Indians who lived in or near Muncie were Woodland Indians. 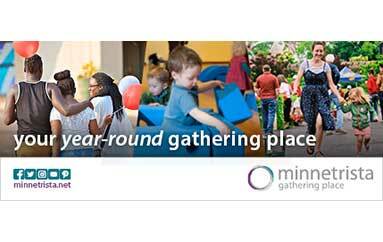 Read the blog hosted by Minnetrista, written by Karen Vincent (Director of Collections) “There Wasn’t a Chief Munsee. Really, There Wasn’t”. 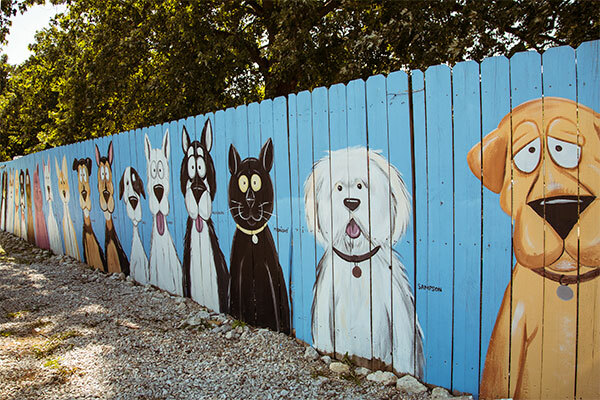 Painted by Brian Blair for the Muncie Animal Rescue Fund. This 8 1/2 foot tall bronze sculpture was created in 2006 by Delaware County artist Kenneth G. Ryden. 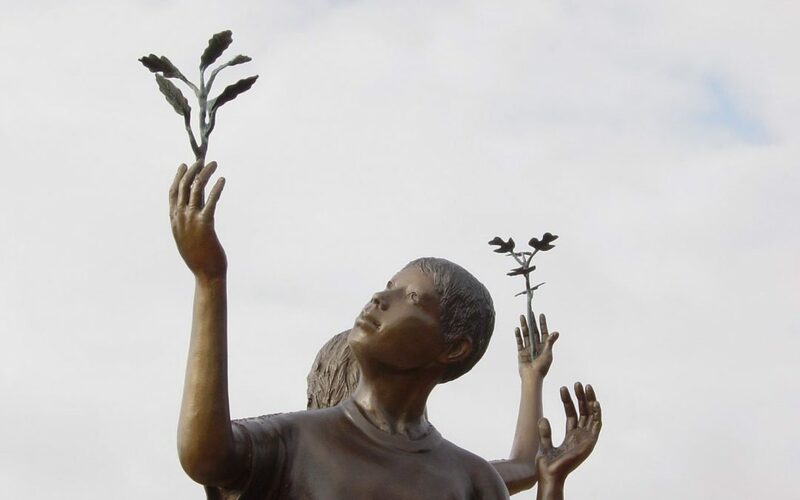 the sculpture features a young girl and boy standing on a stump with tree sprouts emerging from their hands. The sprouting tree symbolizes the awakening potential that lies within a young person. 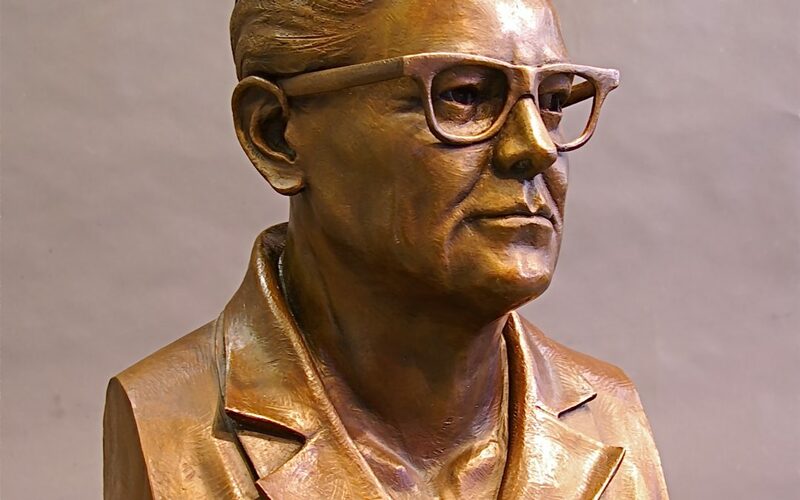 Kenneth G. Ryden is a professional sculptor who has created many public monuments for institutions and municipalities as well as custom bronzes for private collections. He maintains a studio at his Yorktown residence. 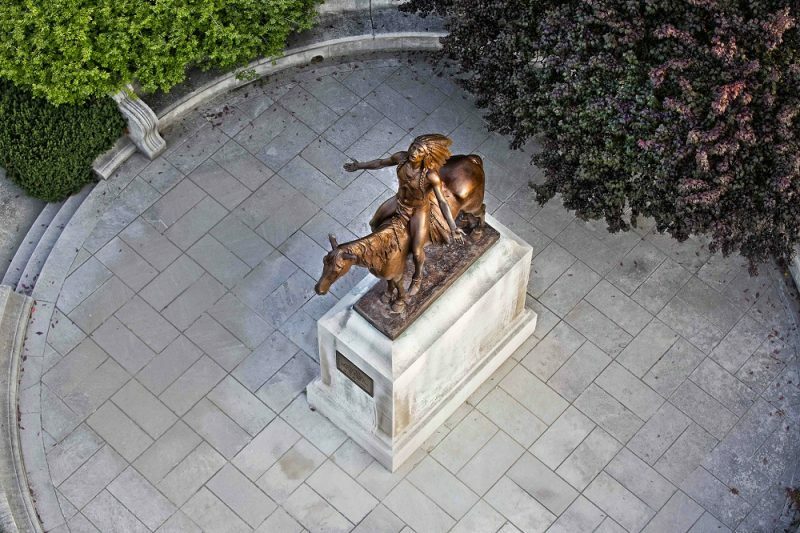 In its almost sixty years on campus, this bronze statue has become the symbol of Ball State University. It was the last commissioned work of renowned sculptor of his time Daniel Chester French (American 1850-1931), best known as the sculptor of the Abraham Lincoln statue in the Lincoln Memorial in Washington, D.C. 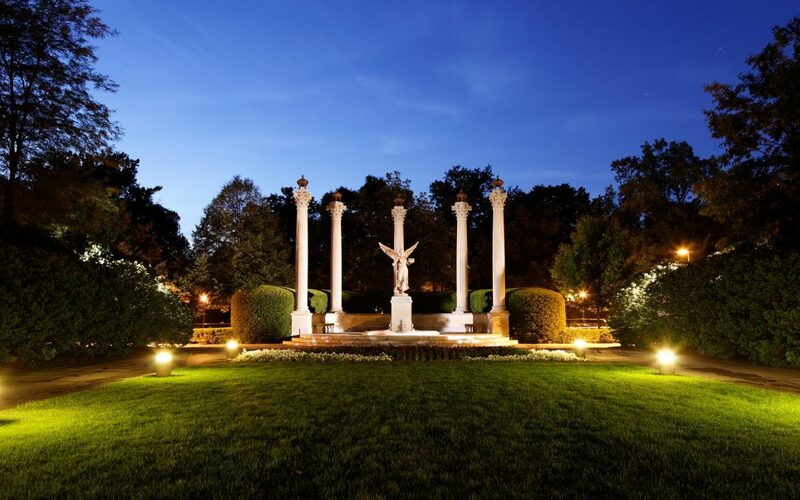 The settings and columns for Beneficence were designed by prominent East Coast architect Richard Henry Dana. The statue was commissioned by the Muncie Chamber of Commerce as a public monument to the generosity of the Ball brothers, each of whom is represented by one of the five Corinthian columns. The bronze statue was completed in 1930 and installed in 1937. 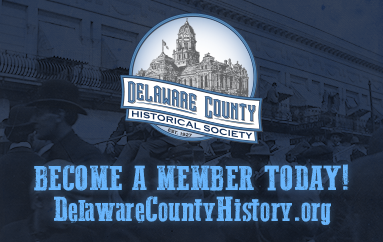 Click here to learn more about the Delaware County Bison-Tennial project.